Why Do They Clip a Feral Cat's Ears? If a feral cat's ear is fully intact, she probably hasn't been fixed. 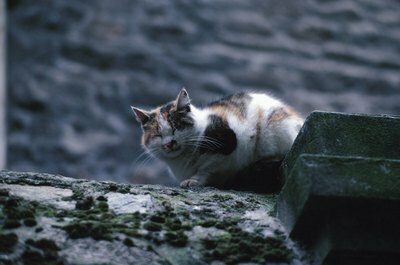 If your neighborhood is experiencing a homeless cat problem and you want to do something about it, a trap-neuter-return mission may be the way to go. When you're unsure whether a cutie has already been fixed or not, quickly glance at her left ear. A clipping means yes. Trap-neuter-return (also known as trap-neuter-release) is a kind way to minimize the troubling homeless cat overpopulation in neighborhoods and cities across the country. Feral cats are essentially wild and are in no way socialized to human interaction. Therefore, the little guys are very difficult -- if not impossible -- to adopt out into homes. Trap-neuter-return efforts aim to get the cats fixed, then release them back into the habitat to which they are accustomed -- the outdoors. Trap-neuter-return missions not only focus on neutering and spaying cats, but also on getting them vaccinated against potentially dangerous infectious diseases such as rabies, panleukopenia, herpesvirus, chlamydiosis and calicivirus. These shots aren't only intended to protect the kitties themselves, but also any people they may encounter while outdoors. When a feral cat gets trapped and neutered, the veterinarian also will lightly clip her ear as an easy identifying marker. This process is sometimes referred to as an "ear crop." According to the animal rights organization PETA, approximately one quarter of an inch is always taken off the upper portion of a kitty's left ear. Doing this notifies other concerned members of the community that the cat has been altered and vaccinated. If you're interested in spaying a feral cat, all you have to do is look at her ear to make sure the surgery is still necessary. Ear clipping prevents you from bringing cats in that have already been fixed. If you're interested in trap-neuter-release but are worried that the ear tipping will be painful and traumatizing to the feral cat, don't be. While the veterinarian is clipping the ear, the little one won't be aware as she'll be under general anesthesia. She won't feel a thing, so rest easy, relax and get to rescuing -- stat. Your neighborhood's cats are counting on you. Do Cats Have to Be Quarantined to Enter Puerto Rico? What Do You Do If the CO2 Is Low in a Saltwater Aquarium? What Do You Do When an Older Cat Becomes a Picky Eater?